In the past, people only used cell phones to call and text, or occasionally—very occasionally—check their email, but that was it. Nowadays, however, with the invention of smartphones, there are so many new things you can now do on your phone: surf the Internet, stream online video, download apps, and so on. 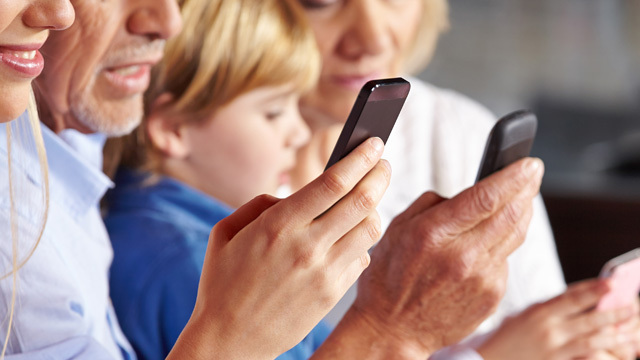 All these new activities can add up to a hefty phone bill, and if you’re paying for your kids as well, the family cell phone bill can become a real financial burden. How can you lower your cell phone bill? Read on to find out. Do you really need all those minutes that you’re paying for? If not, call your service provider and see if you can switch to a cheaper plan with fewer minutes. Or, if you are the kind of person who is constantly exceeding the minutes provided in your plan, maybe you should consider upgrading to another plan that can provide adequate calling time. If your kids prefer to text rather than call, think about cutting down their phone minutes and paying for an unlimited texting plan instead. Most service providers will have an app you can download to your phone that allows you to check how many calls and texts you’ve sent out, and how much they cost. Even if there isn’t an app, you should still be able to find a list of calls and texts you’ve made on the service provider’s website. Check once or twice a week to make sure you’re not going overboard. Ask your service provider if there is some way for you to limit the number of calls your child makes, or the apps he or she downloads. Sometimes kids can talk for hours and hours on the phone without realizing how expensive that is. Setting a limit on their calling time will remind them to keep calls short. Make sure that your phone automatically switches from 3G to wireless when there is free Wi-Fi available. Don’t stream online video or download large files on a 3G Internet connection; wait until you’ve got free Wi-Fi. Surf mobile versions of websites: these usually contain less data and load much faster. There are many apps out there that allow you to make free phone calls and send free texts, as long as you have a Wi-Fi or 3G connection, and the person you’re sending the calls or texts have the same app installed on their phones. Since most of these apps are free, it shouldn’t be a problem to get your friends and family to install them. The cost of one phone call or one text may seem very small, but over time, it does add up. However, by changing the way you use your phone and installing some apps, it should be fairly easy to lower your phone bill.